زند وکیلی, محمود. (1389). بازرسی کشتی های جمهوری اسلامی ایران توسط آمریکا، یک راهبرد یا یک تاکتیک جنگی. علوم و فنون نظامی, 7(16), 39-60. محمود زند وکیلی. "بازرسی کشتی های جمهوری اسلامی ایران توسط آمریکا، یک راهبرد یا یک تاکتیک جنگی". علوم و فنون نظامی, 7, 16, 1389, 39-60. زند وکیلی, محمود. (1389). 'بازرسی کشتی های جمهوری اسلامی ایران توسط آمریکا، یک راهبرد یا یک تاکتیک جنگی', علوم و فنون نظامی, 7(16), pp. 39-60. زند وکیلی, محمود. بازرسی کشتی های جمهوری اسلامی ایران توسط آمریکا، یک راهبرد یا یک تاکتیک جنگی. علوم و فنون نظامی, 1389; 7(16): 39-60. Inspection of Iranian ships by the U.S.A propaganda strategy or a war tactic? The U.S. sanctions against The Islamic Republic of Iran, the most important clause of which is the inspection of ships, are one of the challenges of our government. International law has precise definition of the “inspection of ships” and it has rendered conclusive ideas about it. 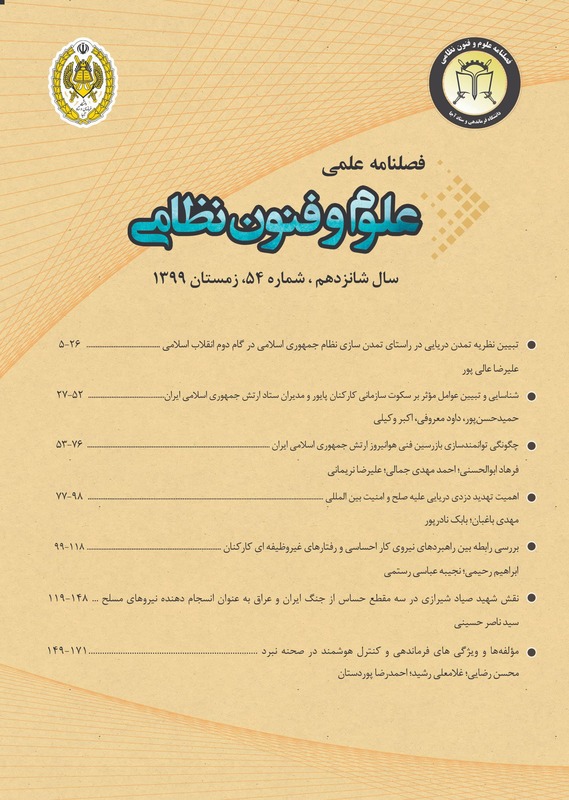 During the eight-year war between Iran and Iraq (Holy Defense), the U.S. and its allies tried to abuse this law, which did not contribute to any effective result due to proper tact of the Islamic Republic of Iran.By explaining these lawful cases, surveying the profiles of the Holy Defense, analyzing the resolutions of the Security Council and its various aspects, this article is trying to find out whether or not these inspections or legitimate, customary or practical. And whether this is a propaganda strategy or a war tactic.